Editor Constantine Kaoukakis: I am a mystery fan, and I realized there isn't a mystery magazine published in Canada. Publisher Diane Walton (President of the Copper Pig Writer's Society): Canada needed a magazine that could showcase home-grown writing talent. Subeditor Barb Galler-Smith: I was very impressed with the two stories I helped to edit. Made me think I should try reading and writing some mysteries, which I haven't read since I was a callow youngster! It was a joy! Diane: We want Sleuth to be self-supporting--without depending on grant funding. So we'll need revenues from subscribers, advertisers, and generous benefactors to make this happen. Melodie Campbell: I decided this was the perfect opportunity to introduce a concept for a humorous new series. To quote Del, the protagonist: "You've heard of The A Team? Vietnam vets turned vigilantes? They had a television show a while back. We're not them. We're The B Team. Maybe not your first choice, but dammit, we could be your best choice. We're women with a mission. We deal in justice, not the law. Sometimes the law lets you down. We try to rectify that." Axel Howerton: It just so happened that I was looking for an excuse to try something with a new character, mixing true crime and hardboiled/noir elements in a short story set in early 50's L.A.—so I gave it my damnedest and GOODNIGHT IRENE is the result. I wanted to do something dark and nasty, in the noir mold. It's kind of an homage to James Ellroy. Tony Stark: In my tale, Watson must find his son's Afghani mother when the boy shows up on the doorstep of 221B Baker St. In the course of the story, Watson reveals in more detail the circumstances of his military service in Afghanistan. He and Holmes also crack a ring of antiquities smugglers and human traffickers to boot. Would you recommend working with Sleuth Magazine? Melodie: A new, paying market for mystery fiction? And it's Canadian? What's not to like? (grin) I'm delighted and honoured to be in the first issue. SG: Full disclosure: I’m friends with many of the editors who work on Sleuth, as well as the publisher. Even so, I absolutely recommend working with Sleuth. They are intelligent, seasoned editors who have a real passion for mystery/crime writing, and work respectfully on accepted submissions. Also, they pay decent rates for stories and are unstinting cheerleaders for their authors. What’s not to love? Melissa: I had a terrific experience with Sleuth Magazine. They paid promptly and worked hard to edit the story. I’m excited to join the inaugural issue with my fellow interviewees, as well as Mike Resnick, EC Bell, and Tyner Gillies. The cover is bang on its genre. I even like the POLICE LINE DO NOT CROSS kind of font for the title and the page footers. I only wish I could’ve joined the launch in Calgary! Tony: Yes, I would thoroughly recommend Sleuth magazine. The editors are first rate and everyone at the publication is dedicated to the art of mystery writing. Axel: I loved the experience in working with Sleuth, especially with my amazing editor Barb Galler-Smith. In fact, I'm hoping to be able to help out a little more behind-the-scenes to help keep Sleuth alive and kicking. 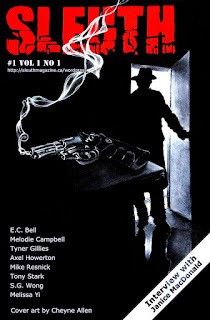 There are precious few venues left for Canadian crime fiction, or crime fiction in general, so something new like Sleuth needs to be protected and given space to grow and mature into its potential—and with people like Melissa Yi, Melodie Campbell, S.G. Wong, and Mike Resnick gracing the pages, it has tremendous potential indeed! But mostly dark and nasty women. I better go track it down. I downloaded my copy over the weekend. Looking forward to reading it. Congrats to all involved! Thanks, Melissa, for turning us on to a new market. It's always great to see startup magazines. Good luck to everyone on the team. Thanks, @Robert! I'm not surprised that you knew about it already. You're welcome, @Paul. Yes, it's heart-warming when people start up quality mystery magazines. Cool.....something else I need to pick up once my amazon associate account payment hits. @Kevin, I've never managed to score an Amazon Associate payment. Good on ya, and thanks for the support! @Melodie, the igloos keep us edgy. :) Thanks for the interview. Great blurb! Sounds good! Thanks for the heads-up! And all the best with the magazine!